I have never been a fan of horror. However, I do love a good laugh at disgusting things. 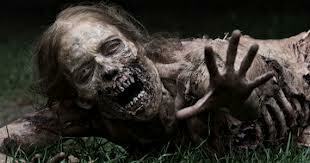 My laughing at grotesqueness has led me to fall in love with shows such as The Walking Dead. While a zombie apocalypse is pretty scary, the absurdity of the violence makes me laugh and cringe at the same time. For the characters in the show, the struggle for life is showing the audience how to survive in a similar situation. The ‘walkers’ are a constant reminder of “what I permanently thrust aside in order to live” (Kristeva 3). The fact that a zombie used to be a human but now feeds off of them is another example of the show promoting “abjection [as] the failure to recognize its kin” (5). A zombie has thrown out what it means to be human and now feeds off of its old self. But back to the grotesque violence. The Walking Dead offers me a “pleasure in perversity” (Creed 256). Maybe I should not laugh at the zombie falling through the roof and having its intestines catching on the ceiling before it falls to the ground. The filth and disgust of the show is symbolic and a representation of “a more archaic level…invok[ing] pleasure in breaking taboo on filth…and a pleasure of returning to that time when mother-child relationship was marked by an untrammeled pleasure in ‘playing’ with the body and its waste” (Creed 256). Every time someone or something is killed or ripped apart, the body (inside and out) is being played with. While my friends around me are telling me how they are about to vomit at the sight of someone being eaten alive or having their leg chopped off, deep down they love to be disgusted. Why else would they keep watching four years later? In the end the zombies in The Walking Dead are not simply repulsive corpses but are “seen without God and outside of science, [they are] the utmost of abjection” (Kristeva 4). They are a lost cause and need to die. That being said, I wish all the luck to the living characters in the show…except Carl…I hate Carl. Honestly I’m getting kinda tired of this show. Don’t get me wrong, I have enjoyed the ride thus far, but the show has digressed to the point where the zombies themselves are just a matter of fact rather than being key to the plot. Quite frankly, they stay safe inside the prison, Rikk and Kurl and the rest of the gang aren’t really very interesting. However, in terms of abjection, this is a fantastic example. I think this is a good example but you focus a lot on the absurdity of the violence. The zombies are abject but the absurdity of what is done to them and other people through them is what we draw pleasure from? At least that’s what I understood from this.